Winning in the demand management game requires granular visibility of the market, and software that can take action using the many data streams now available. Those who rely solely on spreadsheet analyses may be left behind. Do You Have the Information? Winning the game in demand management is a yard-by-yard gain. There may be some super long passes and some genius calls, but by and large, making progress requires granular visibility of the market, and software that can understand the data and, like a great quarterback, call the shots in a timely way. Big spreadsheet analyses that take days will probably not meet most of your customers’ high performance requirements—whether they are retailers or OEMs. So suppliers really have to be able to take in all the data, call the shots, and make their move very quickly. No Hail Mary play will get you to the goal. Everyone raves about the genius of Steve Jobs, creating a great product that was massively accepted in the market; or the blockbuster drug that carries a company to greatness. However, the iPhone, Lipitor, and other homeruns were the product of painstaking effort, much research, trial and error, and competitors’ successes and failures, as well. Consumer Data—in the past we have talked about various ways to gain consumer data through customer engagement.3 Social, website, and mobile data analyses are emerging as intelligent sources. POS—in consumer products we tend to think about POS as point of sales data. Many retailers have been working to provide better/cleaner POS to suppliers in a more timely way. Some firms combine POS with other subscription data they get and run monthly or weekly analytics and big spreadsheet exercises to determine weekly replenishment requirements. Most demand-forecasting solutions have been pulling in this POS data. Whatever method you use, the challenge is not only with granularity, but the time to action. Daily data may be required. But what is also required is the ability to process the data and turn it into actionable information. 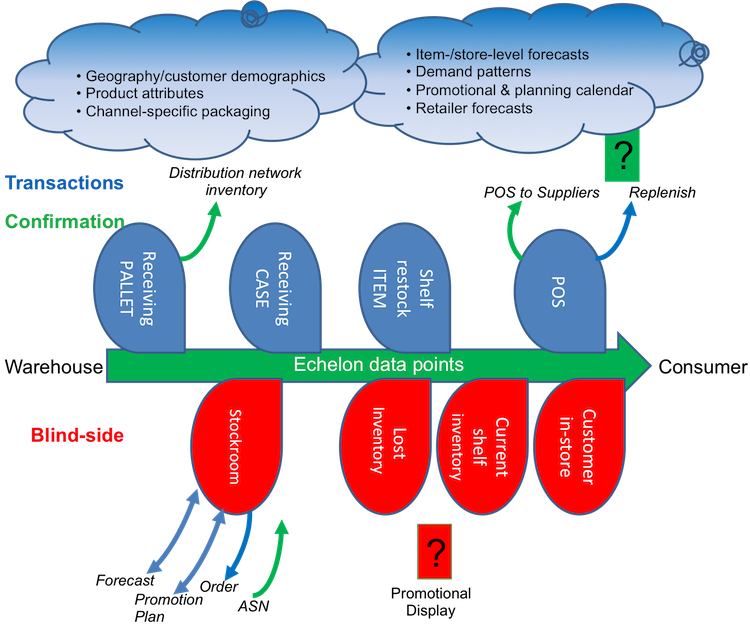 Echelon Demand and Inventory—in the past, we relied on inventory-status data in aggregate, netting safety stock to create new forecasts. But today, demand-sensing solutions look at consumption, inventory, and other factors across most distribution points—each and every site—to gain a much more accurate picture of echelon demand. All this data has unique streams that come to us in various timelines and at different aggregated levels. For example, distribution center data may be aggregated case by case. Manufacturing may be by pallet and shelf, or POS at an item level. Other challenges remain. Organizations not only need to collect all the consumption data points to get the total picture of what is going on, but need granular views of the inventory, the rate and reason for consumption, and obtain the data on time. Organizations need to think beyond a ‘flat file’ forecasting paradigm and see these many points along the chain and how they are impacted by events—seasonality, promotions, the effectiveness of certain channels, competition, etc. Demand Management systems need to take into account these broader capabilities. There are several interesting solution players who have been attacking some, or all, of these data streams to provide richer and actionable data. Firms like Terra Technology initially focused their Demand Sensing solution on the distribution echelons, making a very positive impact on their customers’ replenishment plans. Another solution provider, Orchestro, has a product called SHELFSENSE, which focuses on the shelf-level details, looking at the behavior of products on the floor. Issues such as unrecorded out-of-stocks, lack of adherence to planograms (making it difficult to locate product in the store, thus, slowing sales), poor or no promotion preparations, are discovered and corrected. The manufacturers and/or the retailers do not merely get a clearer picture of what is actually happening at the shelf, they achieve their main goal of doing something about it. Part of the Orchestro system allows analysis across channels to determine if an issue is a one-store problem, a chain-wide problem, or affects multiple chains. The devil is in the details, and diagnosing the problem allows for a response that is tailored to each situation. Logility has created a flexible ’abc’ product segmentation and analysis. Logility was actually the pioneer of the multi-level forecasting model decades ago and they have continued a pragmatic path forward to analyze granular data for demand and supply planning. Old-style abc analysis looks at the cost of products vs. the need for safety stock and evaluates the cost and risk of taking an inventory position. But Logility determined there were a lot more attributes to look at. And each company might have different ways to segment. Like many solutions, Logility’s product segmentation starts with a base of demand history. Then it moves on to a variety of product attributes and behaviors such as its contribution to sales, and gross margin, for example. Why take a strong inventory position on a product if its contribution to the wealth of the company is low? Another set of attributes is based on the life of the product. Logility's Product Lifecycle Management solution looks at products’ changing behaviors as they go through their ‘life’ from premarket planning, various growth phases, sell-through, and promotions, to end of life. This changing view also can become part of the product segmentation process. A product that was a high-margin fast mover in one generation can be relegated as a slower mover, for example, a few years later. Or certain market conditions can accelerate demand. Another up-and-coming company that is moving beyond their spreadsheet heritage is Steelwedge. They have gained traction with firms who have to deal with dependent/independent product demand attributes, focusing on the attach rate. Companies define attach rate differently—some look at attach rate as options for a product and the variety of these options sold in a product family. Others look at attach rate as the complementary products sold along with the product. We look at the former definition as the one most needed and probably most likely to be a forecastable attribute. Product styles and their options can vary based on markets, price bands, channels, special promotions, and so on. This view is necessary if you sell options and configurations of your product. Each and every item has its own behaviors and attributes which may change as the product moves though the supply chain. Companies have spent a long time finessing and guessing the so-called re-order points, rather than looking at the products and how they behave and how their lifecycle, the channel, or a variety of end-market issues impact demand. Today we have rich streams of data that can be analyzed to provide rich new insights. Many companies still spend days poring over spreadsheets. Not only does that take too long, it doesn’t include these rich streams of data, nor does it provide insights into the changing patterns of demand and product attributes over time. Companies’ growth and profits improve one yard at a time. In order to get to the goal line over and over again, companies need to take advantage of and embrace this fine-grain data, learn to understand it, and turn it into action. It’s a process. But if you don’t begin, competitors will continue to pass you by.